Available in Pink, Coral and Purple. 8086839990 - enter code at checkout. Topcashback currently offering 5% for ToysRus online purchases only, ends today so be quick. This brings total down from £19.97 to £18.98! Bought at Argos last week for £25, so will return it and be £5 better off, thanks just reserved 1. Kids loved this toy last xmas..... for 1/2 day..... don't think it's seen Day light since. The most overrated toy ever released. Just read the forums before buying as so many people have trouble with the app. We were lucky as it seemed to work with the app, unlike many others, but it randomly disconnected all the time. Heat added, great price. Kids were playing loads on these recently. Be aware, the app is discontinued early next year. Thanks OP. I just bought 2. Use voucher code 8086839990 for £5 off !! Please note the 8086839990 code only works when you spend £30 or more online. It isn't as amazing as the ads lead you to believe. My son got one last year when it was at a silly high price. The Toy was only briefly played with, as mentioned it did keep disconnecting from the app. Worth a try at this price. Well you might get your chance Use voucher code 8086839990 for £5 off …Well you might get your chance Use voucher code 8086839990 for £5 off !! At the risk of being booed if I was to buy 2 and then return one would they refund me minus £5? As I only need one but obviously being on this site I'm trying to save as much as possible on a toy the little one will probably only play twice! You are an actual genius! I thought £25 was a bargain... but Argos are getting a return. for £1 more than just the Furby I get the Furby, A Play Doh Sundae set with the plus ones in (Goes with her Noodle set Santa got her) and a Kitty Club Playset with blnky eyes and stuff... all delivered! ‌ . Literally could kiss you pahaha. Seriously thanks this has been one of my fave deals lol. Heat added, great price. Kids were playing loads on these recently. Be …Heat added, great price. Kids were playing loads on these recently. Be aware, the app is discontinued early next year. I think it means you will still be able to use the app for Furby Connect, but in terms of updates to the software that will discontinue. I think it means you will still be able to use the app for Furby Connect, …I think it means you will still be able to use the app for Furby Connect, but in terms of updates to the software that will discontinue. On the box it says that the app will only be available until 2018. I suspect the same thing will happen as Skylander Battlecast game, they just delete the game server side. You'll still have the app downloaded but all server based interactivity will end. That said, the Furby still works without it, but my kids get more from the app interaction. By sniffing the BLE connnection during one such DLC update, we immediately discovered that the security situation was bad. Right off the bat, none of the standard Bluetooth LE security features (e.g. authenticated pairing or link encryption) were in use by either the app or the Furby Connect. This meant that anyone within range of the communication could intercept unencrypted packets, inject their own content, or establish their own connection with the toy - all without any physical interaction required on the part of the user or the attacker. By sniffing the BLE connnection during one such DLC update, we immediately …By sniffing the BLE connnection during one such DLC update, we immediately discovered that the security situation was bad. Right off the bat, none of the standard Bluetooth LE security features (e.g. 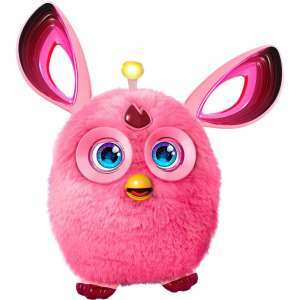 authenticated pairing or link encryption) were in use by either the app or the Furby Connect. This meant that anyone within range of the communication could intercept unencrypted packets, inject their own content, or establish their own connection with the toy - all without any physical interaction required on the part of the user or the attacker. But on your own Bluetooth you have the option for it to be on but hidden. Yes there'll be hackers that can get around it, but it could prevent a lot. And they can play without the app. My 2 yo loves virtual pets so for £15 it's worth the money even without the app. But I shall be playing with her if we use the app and ensure ours is set to hidden. @adhkarzf you crack me up ‌ . I keep seeing your comments for £20 paha. Well I just got mine for £15 from this. Don't think you can push it anymore than that pahaha. Remember they were £100 last year! Think the £15 ones will be gone soon. But on your own Bluetooth you have the option for it to be on but hidden. …But on your own Bluetooth you have the option for it to be on but hidden. Yes there'll be hackers that can get around it, but it could prevent a lot. And they can play without the app. My 2 yo loves virtual pets so for £15 it's worth the money even without the app. But I shall be playing with her if we use the app and ensure ours is set to hidden. Yeah but if someone searches for nearby Bluetooth devices it doesn't come up. Do you honestly think vile people wanting to see kids are gonna think to go that far to find them playing with a Furby? . Yeah but if someone searches for nearby Bluetooth devices it doesn't come …Yeah but if someone searches for nearby Bluetooth devices it doesn't come up. Do you honestly think vile people wanting to see kids are gonna think to go that far to find them playing with a Furby? .